A lovebird might be one of the smaller parrot species available as a companion pet, but this bird is inquisitive and seemingly always on the go. As their name suggests, lovebirds are known for the loving, attentive bond they tend to form with their mates. Lovebirds are available in a number of color mutations. There are nine species of lovebirds, and all belong to the genus Agapornis, though only a few are typically available as pets; namely the peach-faced, masked and Fischer’s lovebirds. Lovebirds are so named because of their strong pair bonds. Lovebirds range in size from just over 5 inches to just over 6½ inches, which makes them among the smaller parrot species. Lovebirds have short, blunt tail feathers, unlike budgies (“parakeets”), which have long pointed tails, and lovebirds are also stockier. Did you catch the fact that lovebirds are parrots? Yes, although they are small parrots, they are still parrots. They belong to the order Psittaciformes, which includes all the parrots. They have a hooked bill and zygodactyl feet (two toes point forward and two point backward). Lovebird species can be divided into those with prominent white eye rings — the masked, or yellow-collared (A. personatus), the Fischer’s (A. fischeri), the black-cheeked (A. nigrigenis) and the Nyasa, or Lilian’s (A. lilianae) — and those without an eye ring — peach-faced, or rosy-faced (A. roseicollis), black-winged, or Abyssinian, (A. taranta), red-headed, or red-faced, (A. pullarius), Madagascar, or grey-headed, (A. canus) and the black-collared, or Swindern’s, (A. swindernianus) lovebird. Some lovebird species come in many color mutations, which are produced by selective breeding to bring out certain color traits. In the wild, lovebirds live in small flocks and eat fruit, vegetables, grasses as well as seed. The Abyssinian, or black-winged lovebird, has a specialized diet that includes native figs, which is why they are so rare in captivity. Most lovebird species are native to the continent of Africa; the exception is the Madagascar (grey-headed) lovebird, which is native to the island of Madagascar. Of the nine species of lovebirds, six are listed as Least Concern by the International Union for Conservation of Nature and Natural Resources. However, three of the species have some endangerment concerns. The Fischer’s lovebird and Nyasa lovebird are both Near-Threatened, which is one step closer to Endangered than the six species. The black-cheeked lovebird is the most endangered in the wild of all the lovebirds. It is listed as Vulnerable, which is only one step away from Endangered. Like most birds, lovebirds love to exercise and require the largest cage that your budget and space can afford. Lovebirds that are cooped up in a small cage and never given any freedom tend to become neurotic and can develop self-mutilating habits. Toys are a must for these active parrots. Keep in mind that lovebirds are strong chewers, so choose toys that can stand up to chewing without causing a hazard. With proper care and a well-balanced diet, a lovebird can live between 12 and 15 or more years. Good nutrition is all about balance for lovebirds, just as it is for most birds. A balanced diet provides the essential classes of nutrients: water, protein, carbohydrates and fiber, lipids, minerals, and vitamins. A seed-only diet is a recipe for malnutrition, and malnutrition causes many nutrition-related ailments. The best lovebird feeding option is formulated diets that include the essential nutrients and don’t give a bird the choice to pick through and eat only the bits he likes. Variety is also important for birds, so supplement formulated diets with bird-safe vegetables, fruit, and even healthy table foods (minus any sauces or seasoning). Learn which foods to avoid, and always ask your veterinarian before offering a food to your lovebird if you have any concerns. Lafeber Nutri-Berries and Avi-Cakes are great ways to provide balanced nutrition while also increasing interaction with food. This is nutritious foraging, which promotes better physical and mental health. Lovebirds might be small but they are bold, inquisitive, curious and always on the go. Many people believe lovebirds come in pairs because they are often see photos of two lovebirds cuddled up against one another. No doubt, a lovebird often forms a deep bond with another lovebird. Potential owners should be aware, however, that a lovebird pair might choose not to interact with people, as they will be thoroughly focused on each other. A single lovebird companion needs plenty of social interaction with the people in his/her life, as well as plenty of busy work in the form of toys and safe items to chew up and destroy. A female lovebird can become highly defensive of her territory (cage). Lovebirds are a chatty bunch, singing and whistling all day long. Check out this YouTube video by Relax With Nature that captured an hour of lovebird sounds. Lovebirds are especially vocal at dawn and dusk. With all that vocalizing, you might think that lovebirds talk. Well, lovebirds usually do not talk in the way you expect. They talk to each other, but not so much to people. Although they are not known for their talking ability, their song is pleasant, more so than many other companion parrots. The more lovebirds you acquire (and it’s difficult to buy just one) the noisier they will become. They are flocking birds in the wild and love to talk to one another. 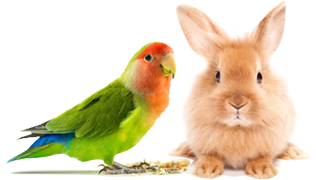 Lovebirds are readily available in most pet stores, as well as from bird breeders. The cost to buy or adopt a lovebird varies. Where you buy or adopt your lovebird from, your geographic region, rarity, and whether the parrot is hand-tamed are some factors that can affect the price. Although the price varies, they usually cost less than parrot species that are large or those that are rare. A random internet search showed prices ranging from $45 to $200. Do lovebirds make good pets? Only you can decide. Consider the bird’s needs and personality to know whether a lovebird fits nicely into your life.